March is National Nutrition Month, and there’s no better way to celebrate than with some delicious and nutritious food! That’s why I was super excited when my BabbleBoxx showed up at my door. I literally felt like a kid on Christmas morning diving into the box, and it did not disappoint! Packed with tasty food and beverages, this box was literally stacked with the best goods. I may even have some discount codes on these amazing products for you, so you’ll definitely want to keep reading. So what’s inside? Microwavable in just 2 minutes with no artificial flavorings, colors, or preservatives, this rice is super easy to whip up and perfect for any meal! The Jasmine Rice has that traditional sticky texture to authentically enhance (and soak up) your favorite Asian dish, and the Wholegrain Brown Rice and Quinoa is super versatile. You can use it as the base of a dish, as a side dish, or in a salad. No matter how you enjoy it, you won’t be disappointed! Does it get any easier than microwaveable rice? Make sure to check VeeTee out here: http://bit.ly/veetee-rice. With only 10 grams of sugar per serving, Wonder Kombucha is the perfect non-alcoholic prebiotic beverage to nourish naturally occurring probiotic bacteria in the gut. It’s certified organic, non-GMO, gluten free, AND vegan making it the perfect way to improve your gut-health regardless of any dietary restrictions. You can get a $4 coupon for Wonder Kombucha for the month of March here: https://amzn.to/2GwYmUe. Eating healthy really doesn’t get easier (or tastier) than Happy Healthy Co.’s Açaí bowls, Overnight Oats, and Smoothies. Their smoothies come in 5 delicious flavors made from antioxidant-rich whole food ingredients. You just add your favorite milk or water, blend, and enjoy! The overnight oats come in 3 flavors made from heart healthy ingredients. You simply add your favorite milk or water, and place them in the fridge overnight. Voila! Delicious, easy oats to enjoy cold or hot. Packed with antioxidants, their healthy acai bowls couldn’t be easier. Thaw and enjoy same day or overnight in the fridge. All cups include only non-GMO ingredients and are produced in a nut-free and vegan facility. Find out more about them here: www.happyhealthyco.com, and get your mix and match bundle box delivered straight to your door anywhere across the continental US. New customers will receive $10 off their first order through the month of March. Nutiva products have been a favorite of mine for years, and their Organic Vanilla MCT Powder and Organic Squeezable Coconut Oil just deepen my love. Made without chemicals, filler oils or additives, the vanilla MCT powder is the perfect way to boost you brain health and metabolism. It’s the perfect addition to your daily coffee, smoothie, or shake to keep you energized while providing mental clarity and fat burning benefits throughout the day. It’s a pure formula free form hexane, chemicals, GMO fillers, dairy, and gluten while also being certified organic, non-GMO, vegan, and Keto. The Organic Squeezable Steam Refined Coconut Oil is made from organic dried coconut without any chemicals. Thanks to the steam-refining process, it has a neutral flavor and scent making it perfect for baking, sautéing, stir-frying, and any and every other way you use butter, olive oil, and vegetable oils. Like the MCT powder, it is also certified organic, non-GMO, Keto, and vegan. Use the code NUTIVA25! or this link: https://store.nutiva.com/discount/NUTIVA25! now through 5/31/19 for 25% off all MCT powder flavors and refined/virgin coconut oil pouches. If you’re looking to upgrade your daily coffee, Laird Superfood Creamers are the all-natural way to do it! Did I mention they’re also great in tea, smoothies, and your favorite baked goods? With naturally occurring MCTs, these creamers provide an energy boost without the crash. They’re made from all-natural, whole food ingredients without anything artificial, and they fit into basically all diets. There’s the Original Superfood Creamer which contains just four ingredients, the Cacao Superfood Creamer for my chocolate lovers out there, the Turmeric Superfood Creamer which is my personal favorite to add to tea, and the Unsweetened Superfood Creamer which has just a subtle natural sweetness from real coconut. Learn more here: https://lairdsuperfood.com/pages/laird-superfood-creamers, and new customers can use the code BABBLE20 for 20% off their first order (offer expires 6/1/19). Let me know which products you try and what you think in the comments below! This post is sponsored by Walmart, however, all ideas and opinions are my own. Life can be pretty hectic. Between work, school, friends, kids, etc., we could all use a little help in terms of having enough time, especially when it comes to making smart breakfast choices. That’s where Walmart comes in. I’ve been making stops at my local Walmart to pick up some of my must-have items like fruits and veggies, plus they also carry better for you, organic options like Annie’s and Cascadian Farm. On my most recent Walmart haul, I picked up Annie’s Cocoa Bunnies and Cascadian Farm Oat and Honey cereals. They’re both certified USDA Organic and absolutely delicious! I enjoyed my Cascadian Farm Oat and Honey with some fresh fruit and unsweetened almond milk before heading out the door. I think we can all agree, nothing beats a 5 minute breakfast! I also love that this granola is non-GMO with no artificial colors or flavors. 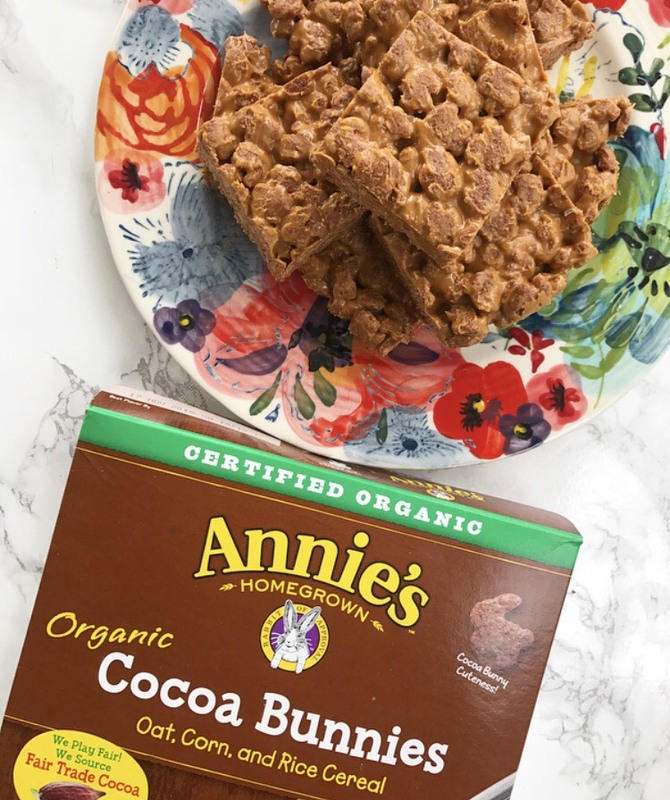 I love my Annie’s Cocoa Bunnies with some milk as well, but I decided to mix things up a bit with these super easy chocolate peanut butter cereal bars. They only require one additional ingredient and will be a recipe that the entire family will love! You just mix together 2 cups of the Cocoa Bunnies with 1 cup of natural, smooth peanut butter, spread the mixture in a parchment-lined 8x8 baking dish, and freeze for 45 minutes to an hour. Once hardened, remove the mixture, cut it into bars, and enjoy! You can also store them in the freezer until you’re ready to eat them. They make for a great snack or on-the-go, better for you breakfast option, and the kids will love them! Who doesn’t love peanut butter and chocolate? 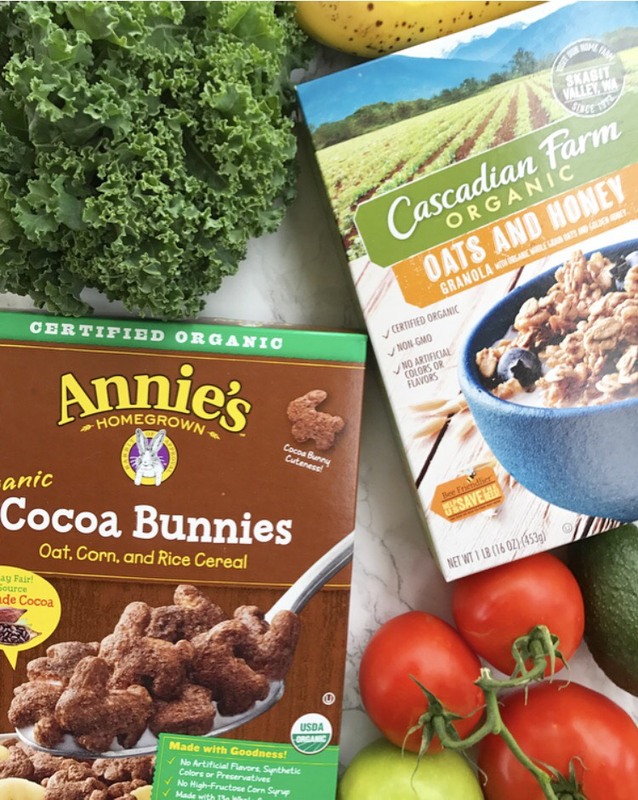 Make sure to head to your local Walmart to pick up your Annie’s and Cascadian Farm products along with your other essentials like fruits and veggies. They make breakfast so much easier without compromising quality by using great, organic ingredients. Whether you choose to enjoy them with milk and fresh fruit or give the protein-packed cereal bars a try, you really can’t go wrong! When I hear the word cleanse, I generally want to run the other direction. It makes me think not eating or eating only one thing. I've done a couple of juice cleanses (which weren't awful), and I've heard of some bizarre cleanses like eating only apples. But the fact of the matter is, I like food...a lot. I'm not really cool with eating only apples or drinking all of my meals for multiple days. And I'm REALLLLYY not cool with starving myself which I will admit I have kind of felt on some juice cleanses I've done. So when I first heard about Newport Beach Cleanse, my initial reaction was NOPE. But I kept reading..."eating plan", okay, so there's food..."organic, non-gmo, gluten, soy, and dairy free", you have my attention..."healthy not hungry" SOLD! I was super intrigued now. I haven't really heard of a "cleanse" that emphasizes eating, so I wanted to know more. A little side note. If I'm being completely open and honest, I have definitely been a little more off than usual this summer. But at the same time, it's summer! It's a time where you can do things outside, spend time with friends, and sometimes that might mean indulging a bit with food or drinking. A couple of my best friends also moved into a new apartment in Philly, so there has been celebrating. And summer concerts are pretty much my favorite thing, which generally also means beer and not so healthy food sometimes. And that's okay. That is LIFE. It's not realistic to be like I'm never going to indulge, especially in times of celebration or with friends. So the idea of this cleanse came at the perfect time. It seems like the perfect way to kind of reshape the last few weeks of summer and get things back on track. Plus the real idea behind a (good) cleanse is to get rid of toxins, reduce inflammation, and reset the body a bit, all things that I can definitely get behind. After learning a little bit more about the cleanse over at their website, for instance, that it was created by a holistic nutritionist who believes in healing through food and all of the goals and benefits of this cleanse, I was in. Without going into too much detail, you can eat whenever you want. If you're hungry, eat! This cleanse just really aims to get rid of the obvious negative things you might be putting into your body and also removes anything that might be causing inflammation. You still eat (tons of) vegetables, fruit, protein (animal and/or plant), certain oils, spices. The list of food you can each is MUCH longer than the list of things you can't. You can also exercise, something I have found difficult during other cleanses due to lack of energy. It's actually an important part of the cleanse. So overall this cleanse seems helpful and most importantly practical. I received the Newport Beach Cleanse Kit which includes all of the necessary supplements for the cleanse, the Newport Beach Cleanse manual, and a shaker bottle. The manual includes the guidelines of the cleanse among a number of other useful tools like a measurement chart and lots of recipes. I used it to meal plan so that I'd be fully prepared at the start of the cleanse. I also took my measurements yesterday so that I can compare them at the end. The main goal of this cleanse for me isn't weight loss (although it does help with that). It's really about resetting my body, resetting my cravings, ridding my body of toxins, and reducing inflammation. I am, however, still interested to see how it does affect my body overall in a measurable way. So here we go. I'm going to be sharing my experience throughout the cleanse over on Instagram (@allroadsleadtohealthy) and Snapchat (allroadshealthy). I hope to share some basic and still delicious recipes along the way. There will be a fair amount of smoothies/shakes involved, so I will try to mix content up as much as possible. But most importantly I want to be real and transparent throughout this. I'll do another blog post recapping my experience at the end and share any measurable changes just to give you an idea. If you're interested in giving the cleanse a try yourself, you can learn more about it here. They've also been kind enough to give me a coupon code to offer you for $30 off the cleanse kit. The code is: 13813, and you just enter it at checkout. Definitely feel free to leave me a comment here or on Instagram if you decide to give it a try because I'm very interested in hearing about your experience!